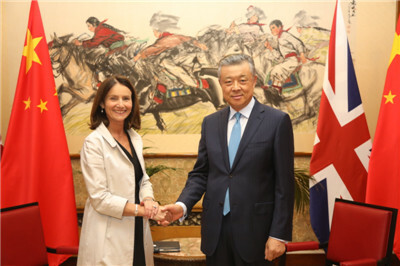 On July 18, Ambassador Liu Xiaoming met at the Chinese Embassy with Carolyn Fairbairn, Director-General of the Confederation of British Industry (CBI), and exchanged views with her on the Chinese-British Entrepreneur Committee, China-UK cooperation on the Belt and Road Initiative (BRI) and Britain’s participation in the first China International Import Expo. Ambassador Liu noted that currently China-UK “Golden Era” has been consolidating with rapid growth of trade and investment between the two countries and more and more investment of Chinese enterprises in the UK. He hoped that, as the representative of British business and industry, CBI could strengthen exchanges with Chinese enterprises and urge its corporate members to participate in the BRI so as to take China-UK economic and trade relationship to a new level. The Ambassador said that, Prime Minister May paid a visit to China early this year, when the two sides announced the establishment of the Chinese-British Entrepreneur Committee and held the first meeting successfully. The Committee is not only an important channel for the Chinese and British governments and business sectors to communicate directly, but also an effective platform for the companies of the two countries to strengthen cooperation. He hoped that CBI, as the British secretariat of the Chinese-British Entrepreneur Committee, will actively carry out activities to enhance China-UK cooperation on economic and trade. China welcomes Britain as the country of honor at the first China International Import Expo to be held in Shanghai this November. He hoped that CBI could encourage more British enterprises to attend the Expo in China. Fairbairn said that CBI attaches great importance to cooperating with China and hopes to work closely with the Chinese Embassy to jointly promote China-UK cooperation on economic and trade. 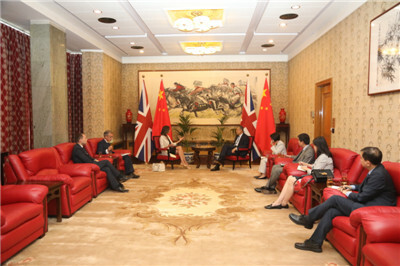 Early this year, the first meeting of the Chinese-British Entrepreneur Committee was held successfully and produced good results. Last week, the Committee held a working conference in Chengdu to discuss the plan for the next step and agree on strengthening cooperation in the fields of education, medical health, high-end manufacturing, creative industries and financial services. CBI also cooperates actively with the Department for International Trade and the China-Britain Business Council to encourage British participation at the Import Expo. CBI will also take an active part in the preparations for the UK pavilion at the Expo.